Today I made a Bluetooth garage door opener. Now I can open my garage from my Android phone. There’s a short how-to YouTube video from Lou Prado. Lou also made a website btmate.com that has more information, and you can watch an earlier howto video as well. – Acquire a Samsung HM1100 bluetooth headset (the Samsung HM1800 also works). You can buy these cheap from Fry’s or eBay. I got mine on eBay for $10-$15. – Crack open the earpiece on the Bluetooth headset and solder one of the earpiece wires to the base pin of a transistor. Solder red and black wires to the other pins of the transistor. – Connect the red and black wires to the garage door opener. It turns out that most garage door openers are built to allow easy insertion of wires, which is nice. That’s more or less it. My soldering was ugly as sin–too ugly for me to even post a picture. And rather than leave the house for some heat shrink tubing, I just left bare wires on the transistor, but everything works fine. Lou wrote a nice Android app that’s free to install and then pay-what-you-want for a license. Then it’s just a single button to open or close the garage door. In theory, I could use Tasker to open the garage door automatically when I get home. – Get a ladder and climb up to the HM1100 headset in your garage. – Turn the Bluetooth headset off and then on–this step might not be necessary. – Press and hold long/middle button (opposite from the ear) for 3-4 seconds to enter pairing mode. – Press the volume up button (it’s the volume button closest to USB power cord) and see two blinks of the blue led. This step enables pairing with multiple devices. – Go into the new phone’s Bluetooth menu and pair with HM1100. – Now go into BTMate/GarageMate app. You can reuse the license key from your old phone. On the new phone, choose the HM1100 as the currently selected receiver. I like to enable the following options: 1) starting the app automatically clicks to open the garage door, and 2) exit the app after it’s been idle for 10 seconds. That’s it! Now you can open your garage door with multiple phones! For a while, I was really into reverse-engineering USB drivers. Don’t ask why. The heart wants what the heart wants. I didn’t finish this “hairball” post, but it has some info in it that still might be good. I recently stumbled across this post and it inspired me. I decided to try to reverse engineer the USB protocol for my Omron pedometer, which can upload your step data, but only to a Windows computer. There are two parts to writing a Linux driver for a new USB device: reverse-engineering the USB protocol, and writing the Linux program. Typically your problem is that a device only runs under Windows. Like it or not, that means that you’re going to need something that runs Windows. It can be a Windows computer, or you can get fancy and run Windows as a “guest” operating system using something like VMWare to do virtualization. That is, you’d install Linux, then install VMWare, then install Windows to run under VMWare. But let’s start simple. Bus 002 Device 018: ID 0590:0028 Omron Corp.
That tells me that the vendorid is hexadecimal value 0x0590 (which is 1424 in decimal) and the productid is hex value 0x0028 (which is 40 in decimal). For other operating systems, this post tells you how to find your vendor id and product id under Mac and Windows. For Windows XP, it looks like you can run “msinfo32.exe” and then look under “Components” and then “USB” and look for “VID_” (vendor id) and “PID_” (product id). In the beginning, it’s easiest to just use a Windows computer and run some software to sniff on the USB packets as they go back and forth. The wild part is that the best open-source/free program I found is five years old (SnoopyPro). It still worked fine on Windows XP though. SnoopyPro is the program you want. There’s a whole long history of how it forked from USBSnoopy (evidently also called “sniff-bin“), and there’s another program called sniffusb which is related but different (I think both sniffusb and SnoopyPro are forks off of the original USBSnoopy/sniff-bin program). It’s all very confusing. I went with SnoopyPro and it worked fine for me. If you’re willing to shell out for a book, it looks like USB Complete, now in its third edition, is one of the best. http://hackspire.unsads.com/USB_Protocol#USB_traffic_analysis – talks about how to convert SnoopyPro (and SniffUsb) logs/traces into hexadecimal data. Are there other options? Sure. USB Monitor from HHD Software is $85 and runs on Windows. Or you could spend $850-950 to buy a hardware USB protocol analyzer. Since I have only a casual interest, that’s a bit steep for me. Wireshark now supports USB as a media type. If you’re running a Linux distribution with version 2.6.11 of the kernel or greater and you have the usbmon module enabled and you have a recent CVS version of libpcap (post-0.9.5) installed you can also do live captures. More details can be found at the USB capture setup page on the wiki. Follow the link in the quote to find Wireshark’s USB wiki page. USB in a NutShell is a pretty good overview of how USB communication goes. This Java and USB tutorial starts with a good overview of USB. This USB and Linux tutorial starts to get into the nitty gritty of USB on Linux. To make the glowing red eye, I punched a small hole in the pumpkin, taped an LED to a battery, and pushed the LED from the center of the pumpkin through the small hole. 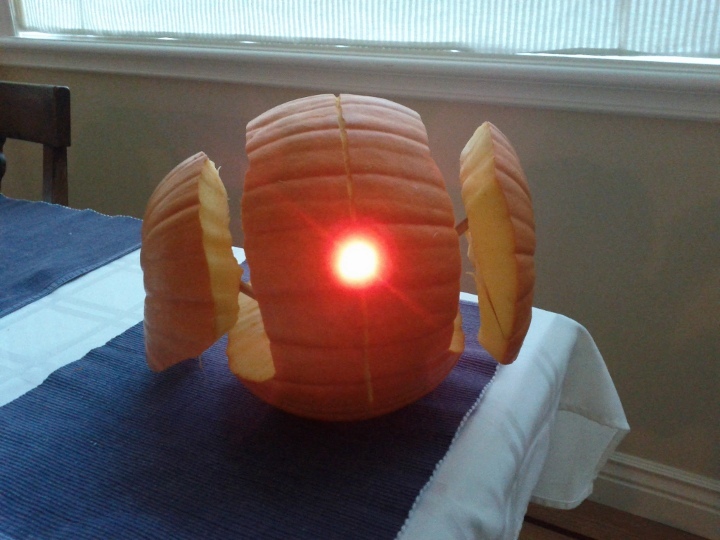 I thought about doing an actual red laser, but 1) I don’t want to blind any kids walking by my pumpkin, and 2) laser beams aren’t visible unless there’s fog or smoke or something for the beam to hit. To make the side “gun” sections of the pumpkin, I had a small dowel rod lying around, so I just cut two small stakes from the dowel rod and jammed them into the pumpkin sides. It’s a bit rickety, but it works. For the video, I played some turret sound effects and moved my red laser over the pumpkin as if another turret was locking onto it. I didn’t want to take long to carve my pumpkin. I finished it in maybe an hour, but check out this really elaborate pumpkin that someone else did. And it turns out that they work at Google too! Happy Halloween, and I hope you’re getting creative with your pumpkin carving! If you want to post some JPEG pictures but you’re worried that they might have metadata like location embedded in them, here’s how to strip that data out. The exiftool will make copies, so if you had a file called image.jpg, when you’re done you’ll have image.jpg with all the metadata stripped plus a file called image.jpg_original which will still have the metadata. Chris Dixon had an interesting post a while ago about how to find start-up ideas. The advice boiled down to keeping a spreadsheet of ideas and talking to lots of smart people (entrepreneurs, potential customers, VCs, people at big companies). It’s good advice. Paul Graham also wrote in 2008 about startup ideas he’d like to fund. Music CDs -> iTunes, Amazon MP3 store, doubleTwist, MP3tunes, etc. Stereo system -> Sonos, Squeezebox, Rhapsody, Pandora, last.fm, Spotify, Grooveshark, MOG, Rdio, etc. Okay, those all seem simple or obvious, right? Let’s go a little deeper. What would you do with this pile of business cards? All of these take a hotspot in your home and inject a cloud or web element to make life easier, more efficient or better. So what happens when you look at a pile of manuals, or receipts? Your alarm clock? Those “Learning Japanese” CDs? A stack of take-out menus? A stack of cookbooks? A hard drive full of MP3s that are disorganized? A hard drive that doesn’t have a back-up copy? An out-of-date programming book? A box full of videotapes? All those back issues of magazines? A blank wall, with no posters or other decoration? Stuff in your garage that you’ve been meaning to sell or give away? Your wallet? Ideas are sitting all around where you live. If you have a small snag, irritation, or hotspot in your life, probably a lot of other people do too. You can make it easier to organize something (can you convert something physical to digital and store it in the cloud?). You can sell niche versions of a product (e.g. Threadless for T-shirts), you can let people make something that they couldn’t make before (CafePress for T-shirts, LuLu for books), you can pool people with similar interests (a blog like Craftzine, or a forum for book lovers or body builders), you can review products in a particular space, you can teach someone to do something. You can become a well-known expert in something and then sell your time or expertise as a consultant. You can make a free version of something useful or fun, then sell more features or consult on more involved cases. You can do meta versions of lots of these, e.g. Etsy is a marketplace for people who like to buy and sell custom crafted objects. I’ll stop with a story. I have a friend at Google who is really good at noticing things that annoy him. While walking from his car to his desk in the morning, he can easily find six things that irritate him because they should be improved. I’m not recommending that you make yourself more irritable, but I am saying that if you notice all the times you run across something that can be improved, those are opportunities. And I think one of the easy methods of spotting start-up ideas is looking around where you live and how you spend your time. Find the hotspots in your own life and you might identify some great products or services to build.